Finally back to Stashbustin'. It's been a longer break then I intended. This dress had been waiting to be hemmed for some time. I am still unsure of whether I should shorten it a bit more. If I would wear it mostly with tights then yes, but in reality I am most likely to wear it without, it being Queensland and all, and then I probably don't want to shorten it, cause those little dimples on my thighs don't need to be shared liberally with the world at large. This is the Audrey C Dress from Maria Denmark. 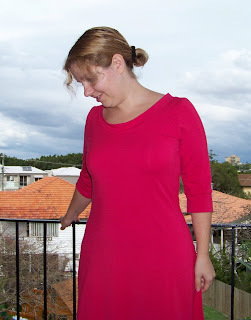 I used a bamboo knit with 4% lycra from the Bamboo Fabric Store. I was under the impression I ordered the colour red, but after I washed it it looked definitely hot pink. I have mixed feelings about this dress ... sigh. However, the fabric was a 4 way stretch not a 2 way as the pattern asked for. I graded out for my larger hips, but it's still a bit tight around my hip/bottom. I made the skirt more A-line and I shortened the arms a little. This is a rather unflattering picture of my back, but it probably illustrates all my problems with the dress. It came out a little small. Either I got the sizes wrong (always a possibility) or the fabric stretched whilst I cut is or even a combination of both. Either way, combined with my least favourite bra and a pair of tights that digs in a little, it is not particularly flattering look on me. However I have a wide belt that I could wear with the dress and thus eliminate at least one of the rolls on the back. You can't really tell from the picture, but the patterns has 2 back darts and there my fabric choice came back to bite me. I did the darts in a straight stitch, but because it is a 4 way stretch it didn't really work. I had to shorted them and resew them in a small zigzag stitch and then I struggled getting them to lay flat. I don't know whether I like darts in knit fabric, but since this is the first time I came across them, I am keeping an open mind. My personal preference leans towards adding a back seam and omitting the darts if I make this pattern again. Finally, after the issue with the darts, which only became apparent once I tried the dress on, I started on the neckband ... ohhh the neckband. I screwed up the neck band REPEATEDLY, no really, this is version 4 and it's staying, I don't care that it is not laying flat. Isn't it disappointing when you try so hard. I wonder whether back darts are really needed in a knit? As you say, maybe a seam you could take in down the back. The dress does look nice with the cardigan over - that would hide the back nicely. The dress probably feels lovely to wear, being bamboo. Don't be too hard on yourself- every fabric and every garment is different so there are lots of learning curves.